Construction of a new terminal began in 2005 and was fully operating by 2008. The airport expansion provides a state-of-the-art terminal building, which is more than three times bigger than the current one at 116,000 m2. When the three construction phases are complete the airport terminal will be over 500,000 m2 and be able to handle 40 million passengers a year. Over the period of the project the airport site will enlarge from the current 25 km² to 80 km². The airport as a whole will resemble Amsterdam's Schiphol airport in size and will be able to handle over 500,000 tons of cargo and 200,000 flights a year. On August 28, 2014, Tianjin Binhai International Airport Terminal 2 came into use. The second floor is used as an arrivals hall, while the first floor is a departure hall. Underground, on level B1, there is a public transport hub, used to connect the airport terminal to various methods of public transportation. This includes a subway station level, a transfer hall and an underground parking lot. 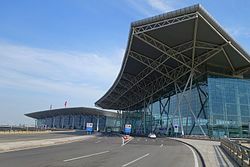 Terminal 2 is connected to subway line number 2, meaning that passengers can get to the terminal straight from Tianjin Railway Station. The Airport is served by Binhai International Airport Station on Line 2 of the Tianjin Metro since the station's opening on August 28, 2014. The metro fare to downtown is 3 yuan. ^ "Airbus in China". Archived from the original on 2 April 2018. Retrieved 7 June 2015. ^ "Hainan Airlines 1Q19 Vancouver service changes". airlineroute.net. Retrieved 17 December 2018. ^ "Tianjin Flights Schedule, Flights to Tianjin and Flights from Tianjin". Retrieved 7 June 2015. 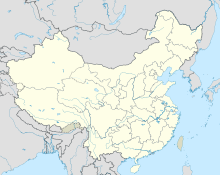 ^ "Air China adds Tianjin Osaka service". Routesonline. Retrieved 30 January 2019. ^ "JC (Cambodia) International Airlines launches Sihanoukville-Tianjin service – Blue Swan Daily". blueswandaily.com. Retrieved 11 December 2018. ^ "Okay Airways adds Da Nang service from July 2017". routesonline. Retrieved 23 June 2017. ^ F_221. "German air cargo carrier opens Tianjin-Frankfurt route". Retrieved 7 June 2015. ^ "2号线机场延伸线28日开通 天津站至机场票价3元". Retrieved 7 June 2015. Airport information for ZBTJ at World Aero Data. Data current as of October 2006.